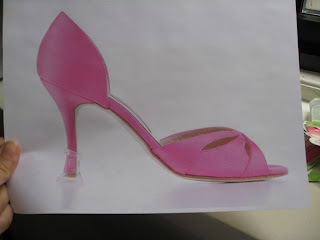 SoleMates High Heelers! Protect your heel and gain some stability in challenging walking environments. 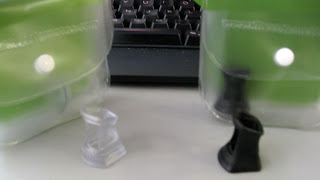 Don't they look like little chess pieces? Me holding up signs from SoulMates press kit. I was unable to try these out because, in my very large file cabinet drawer full of shoes, I could not find one pair with heels skinny enough to fit. 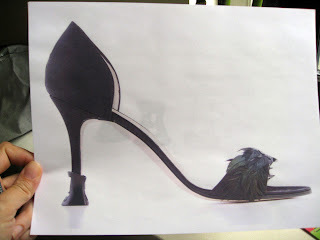 So I must protest SoleMates High Heeler claim that they "fit most heels ranging from kitten to stiletto." To be fair, I hate kitten heels and all my stilettos are at home. And no, SoulMates aren't totally invisible, but I do love the idea of protecting one's heels while enjoying messy lawn parties. And how about NYC sidewalk issues, like horrid subway grates? And those days you're out in the country running down gravel roads in stilettos? Scary, scary heel navigating. 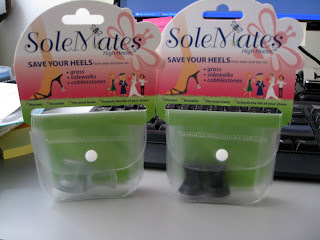 SoleMates was kind enough to send a co-worker a few samples, so if you'd like a pair email me (fashionherald@gmail.com). I've got 3 clears and 2 black that will go to first requests. And if you're laughing now but cursing yourself for missing out later, you can find your SoleMates on 34th Street at Duane Reade and Bakers. I would like to order this!